Bonna’s childhood is miles apart from the childhood that most children in our country experience. Her parents sold her shortly after her birth. Many parents in Bangladesh are so poor that they aren’t able to look after their newborn baby, and so they sell it, hoping that it will be better off elsewhere. Bangladeshi girls are often sold for a particular sum for work or prostitution, or they are married to those who are willing to pay. Bonna was sold to a man from the neighbourhood named Sharabet Shek, who didn’t have his own children. Seven-year-old Bonna doesn’t like speaking about that time. Her stepmother, who Sharabet married later, treated her very harshly – she beat her and shouted at her. Everything changed when Sharabet’s sister Jhuni visited them. Although Jhuni was very poor herself, when she saw what conditions Bonna had to grow up in, she decided to take her away from the harsh treatment, out of the southern region of Gopalgonj, and to the capital Dhaka. By the way, Bonna’s name comes from this area. It actually means “a flood” in Bengali. And floods torture the southern region very often. “She came to me, she was crying and begging me to take her with me. I knew that I couldn’t provide her with a nice home but I was convinced that I could give her love, which she needed so much,” Jhuni remembers about the time when Bonna first entered her life. Bonna has had a new family for two years now – “Aunt” Jhuni and five siblings. Jhuni’s two oldest sons are already married, the other son and daughters live with her in one of the poor dwellings of the Dhaka slum Chalantika. Neither Jhuni nor any of her children have ever gone to school. There hasn’t been money for it. Jhuni works as a home help, her two daughters work in a textile factory, and the youngest son Rubel (12) sells fish at the local market. 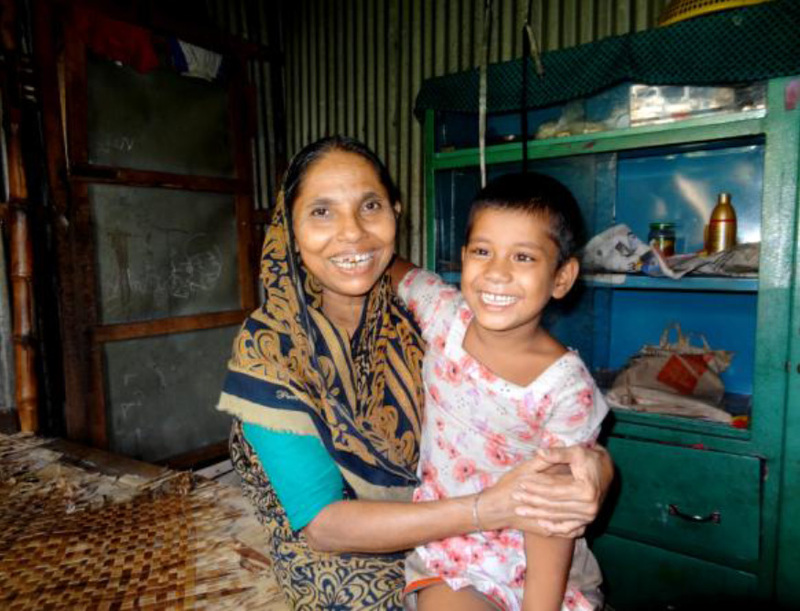 It is Rubel who has looked after Bonna during the day for two years now and who takes her to the market with him and looks after her while Jhuni is working as a home help. Jhuni earns around 2,000 Bangladeshi Taka a month, around 500 CZK when converted. She uses two thirds of the sum for the rent, which the daughters and the son also contribute to, and the rest is needed for buying food. Jhuni cooks for everybody once a day: in the morning they eat pantha (a dish of the poor: boiled rice soaked with salt and chili overnight), in the afternoon they always have rice, dahl (boiled red lentils), and vegetables with chili peppers. The family doesn’t have money for anything else. Eventually, fortune smiled on Bonna here in Chalantika. She received the opportunity to go to the slum centre ADRA, run by the organization ADRA CR and by the locals. Besides education, nutritious food and health care are guaranteed for Bonna here. 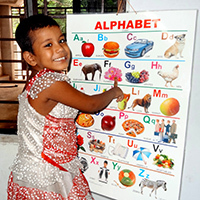 The girl really likes going there, she managed to learn the English and Bengali alphabet quickly and she can count up to twenty. Her dream is to become a teacher one day, like her idol – the teacher Happy from the ADRA centre. Although Bonna can only recognize individual letters and cannot build the whole words yet, she is fascinated by books. She likes leafing through them, looking at pictures and explaining what is written in them to other children. She also likes playing in the street with other friends that she made at school. Sometimes they visit each other at home. Jhuni believes that Bonna will continue attending school and that an easier life than she has had herself is awaiting Bonna in the future. She is convinced that education can help this. “Please, keep on supporting her. I really wish she would be happy,” the woman asks Czech donors and thanks for the present help.